OK, everyone: Glitter lips are officially a thing. Thanks to legendary makeup artist Pat McGrath, the phrase "sparks fly" should now be "sparkles fly" when we're talking about kissing. 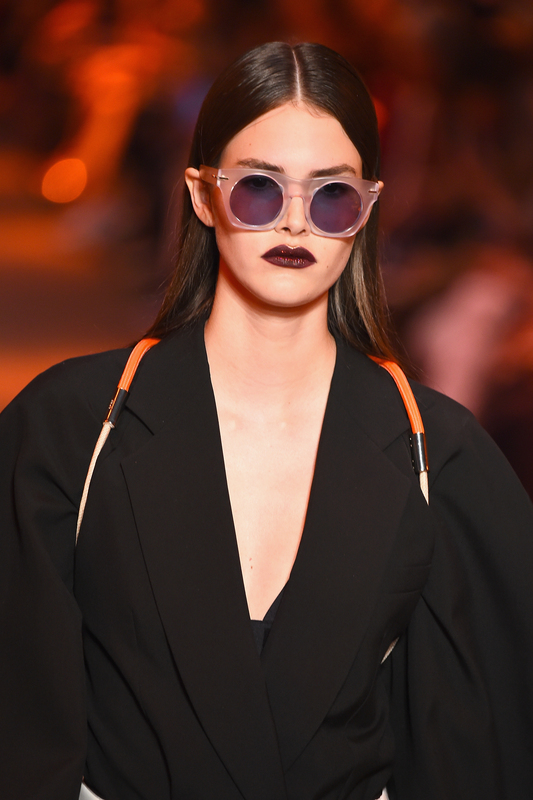 Her LUST 004 lip kit, which is the ultimate product fort creating perfectly sequined lips (move over, Kylie Jenner), has brought the glitter lip trend to countless celebs Instagrams, the VMA red carpet, and, most recently, the DKNY SS17 runway. Since it's officially a trend (pro trip: if you spot it three times, it's a trend), you must be wondering: How can you get glitter lips at home? Luckily, though, just because Ms. Mcgrath happens to be the glitter lip queen doesn't mean that she has free reign over the trend (sorry, I had to). Here's exactly what you need to do to get this celebrity-and-designer-approved look at home to glitz up all of your future selfies. Pick a gloss in the same color as the glittery look you want to achieve — the more similar in color the gloss is to the actual glitter, the thicker the look will appear. For example, if you want a vampy red sparkle a-la-DKNY runway, choose a vampy red gloss, like this one from MAC. Put on one coat, blot with a tissue, then reapply. Make sure the gloss isn't of the matte drying variety, because you'll need it to stay sticky for long enough to adhere to the glitter. There are a few different tools you can use for this part of the glam process. A regular lip brush, a (clean!) eyeshadow brush, or a Q-tip will all give you pretty much the same result. Dampen the tool with water to make sure the glitter will adhere to it when you're ready to apply. 3. Glitz It Up, Baby! Now for the funnnn part — dip that wet brush in your pot of glitter and go nuts! Choose makeup-grade glitter (so, not the same kind you used for art projects when you were 6 years old) and using your brush tool, dab the product onto your lips starting from the middle and working your way toward the outer edges. Using a clean, dry brush, dust any un-stuck glitter off of your lips, and stick your finger in your mouth to get rid of any sparkly little specs trying to stick to your teeth. Get your glitter on, girls and boys!